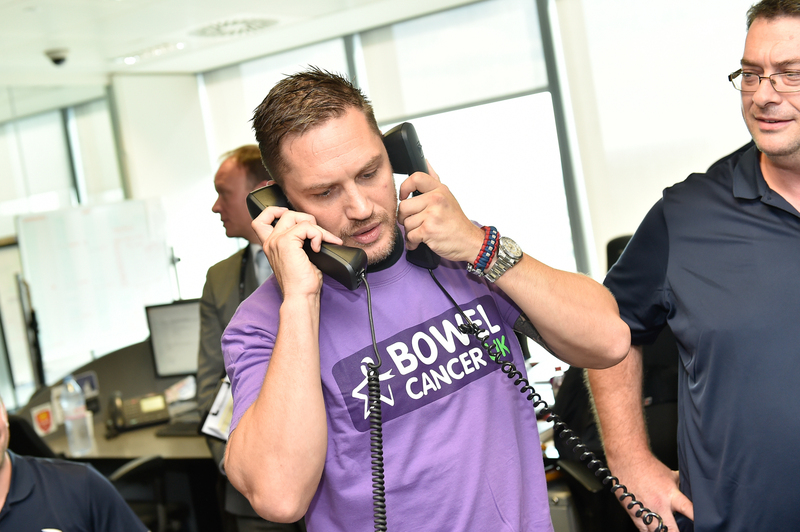 Internationally renowned British actor Tom Hardy represented us for the second time on Monday 12 September at the annual BGC Charity Day. By conducting trades alongside licensed BGC brokers, Tom helped raise valuable funds to support our lifesaving work. Tom was joined at the event, at BGC’s offices in Canary Wharf, by dozens of personalities from the world of film, sport, TV, fashion and music, including Davina McCall, Pippa Middleton, Rio Ferdinandand Al Murray. Every year, BGC Partners and Cantor Fitzgerald, in conjunction with the Cantor Fitzgerald Relief Fund, commemorate their 658 friends, colleagues, and the 61 Eurobrokers employees, who died on 11 September 2001 by distributing 100% of the revenue raised on the BGC Charity Day to the Cantor Fitzgerald Relief Fund and charities around the world, among them, Bowel Cancer UK.